Fill a 5-quart nonstick Dutch oven half full with water, bring to a boil and add 2 tablespoons of salt. Add the rice and boil over high heat until it is al dente and just starts to soften; this can takes about 5-6 minutes, depending on your rice (do not overcook it). Let stand for 2 minutes, then drain well. Wipe out the pot. Uncover the rice and drizzle with 1/4 cup of boiling water. Scatter the butter slices on top. 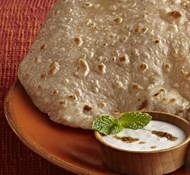 Cover the pot with a clean kitchen towel, then cover tightly with the lid and secure towel around lid. Cook over moderately low heat until the rice is tender and very fragrant, about 45 minutes. Before the rice is done, barberries. Place 2 tablespoons of butter in a small saucepan ad the barberries and heat on medium low heat for 5 minutes. add 2 tablespoons of liquid saffron and 2 tablespoons of sugar and cook another minute. Set aside. When rice is ready, remove the kitchen towel. 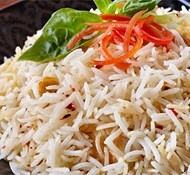 Place 2 spatulas of rice in a small dish and use the 2 tablespoons of brewed saffron to color the rice. Set this rice aside for the moment. Remove the rice from the pot by the spoonfuls. You want to create layers of rice and layers of barberries. Repeat the rice layering and barberry layering until you reach the tahdig at the bottom of the pot. 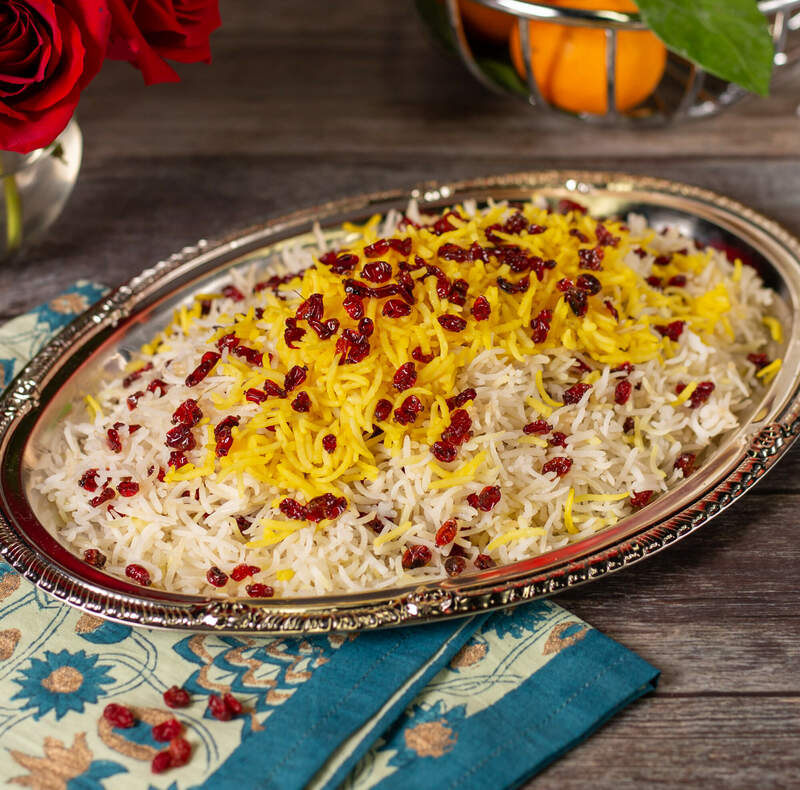 Reserve the tahdig and serve on a separate platter. Take the reserved saffron rice and place it on top of the rice pile. Serve.